NAIROBI, Kenya, Jun 6 2016 (IPS) - Climate change is now adding new layers of complexity to the nexus between migration and the environment. Coastal populations are at particular risk as a global rise in temperature of between 1.1 and 3.1 degrees C would increase the mean sea level by 0.36 to 0.73 meters by 2100, adversely impacting low-lying areas with submergence, flooding, erosion, and saltwater intrusion, according to the UN Environment Programme (UNEP). But even before such catastrophes strike, the 660 to 820 million people who depend on a fishing livelihood – more so subsistence-based traditional fisher families who already find catches sharply dwindling due to over-fishing – will have no option but to abandon both home and occupation and move. The UN Food and Agriculture Organization (FAO) estimates illegal, unreported and unregulated fishing at 11-26 million tonnes of fish each year, worth between 10 billion and 23 billion dollars, causing depletion of fish stocks, price increase and loss of livelihoods for fishermen. The International Organization for Migration (IOM) forecasts 200 million environmental migrants by 2050, moving either within their countries or across borders, on a permanent or temporary basis. Many of them would be coastal population. William Lacy Swing, Director General of IOM, spoke with IPS correspondent Manipadma Jena at the second UN Environmental Assembly May 23-27 in Nairobi where 174 countries focused on environmental implementation of the work that would achieve the Sustainable Development Goals (SDG). Excerpts from the interview follow. Q: What are today the other drivers of coastal migration besides environmental crises and depleting fish stocks? A: Political crises and natural disasters are the other major drivers of migration today. We have never had so many complex and protracted humanitarian emergencies now happening simultaneously from West Africa all the way to Asia, with very few spots in between which do not have some issue. We have today 40 million forcibly displaced people and 20 million refugees, the greatest number of uprooted people since the Second World War. If we add to that climate change events like Typhoon Haiyan in Philippines, and the Haiti earthquake, there would be another additional group. We do not know how many of these natural disasters are climate related, but increasingly we are paying attention to climate change. After the Paris talks it is more evident that we must figure in adaptation strategies, especially in places like Bangladesh and the Pacific Islands, so people can avoid and prepare for the natural disasters. Anote Tong, president of Kiribati, was saying they were fearful they would lose some of their 33 atolls. They are already purchasing land in neighbouring Fiji for their people to migrate. This is the kind of adaptation action we need to take. Q. How do you see the picture of global coastal migration by 2030 and subsequently by 2050? What are the approximate numbers of coastal people that are on the move today? From which countries are the maximum movements being seen? A: Coastal migration is starting already but it is very hard to be exact as there is no good data to be able to forecast accurately. We do not know. But it is clearly going to figure heavily in the future. And it’s going to happen both in the low-lying islands in the Pacific [and] the Caribbean, and in those countries where people build houses very close to the shore and have floods every year as in Bangladesh. Also, we have to look out for places prone to earthquakes. Philippines officials were talking to me last week about preparing for a major earthquake that could happen anytime. We have to have an adaptation policy. The more adaptation you have, the less mitigation you need. The more you prepare the less you have to lose. Q. Are increasing incidences of conflict over depleting resources being reported within coastal communities or with other groups such as large fishing operators? A: It is quite clear that we will have more and more conflicts over shortages of food and water that are going to be exacerbated by climate change. Certainly, if coastal stretches have been over-fished for years, there is going to be conflict. But it may not be just conflict that occurs. In Indonesia for instance, IOM worked hard to evacuate hundreds of fishermen who had been kept for years in human slavery in the fishing industry. With the help of the Indonesian government we freed them, counseled them and got them back to normal life. Q: Even while migration is increasingly being recognized as a critical global issue, the absence of strong policies on migration is often attributed to insufficient studies and hard data by migration experts. Has there been any improvement in this status after Syria, West Asia, East Africa migration crises? 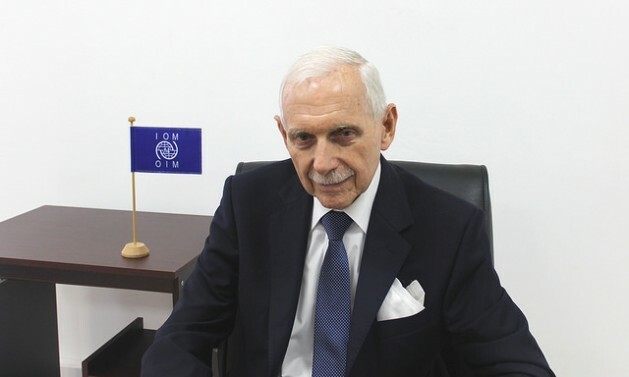 A: IOM has undertaken several initiatives to support better policies. We just established a Global Data Analysis Centre in Berlin. We are in partnership with a number of leading agencies like Gallop World Poll, the Economist Intelligence Unit (EIU) the research arm of The Economist Group. We are looking for other partners as we see large gaps in the data base. While a lot of data we have is spotty, a lot of it inaccurate, we however have enough already to know which are the driving forces for migration today and in the future, including demographic drivers. We have an aging population in the industrialized countries that are in need of workers at all skill levels. And we have a very large youthful population in the global south that needs jobs. Our forecast is that countries are going to become almost inevitably more multi-cultural, multi-ethnic and multi-religious. If this is going to work, economies are going to merge then it appears a pretty straightforward future scenario. But the problem is that more national migration policies are out-of-date, they have not kept up with technology. So we keep running into problems where we could in fact turn adversities into opportunities. Q: What could be some mitigation, adaptation or preventive actions and policies affected countries should undertake? Which countries are already taking action? A: Even if it is difficult to single out countries to mention as they are all members of IOM, Canada for instance took in 25,000 Syrian refugees earlier in the year. Several Asian countries like Thailand are providing migrants access to free public services because if this is denied you have unhealthy population living amongst you. There are other examples of proactive action being taken by countries but more is needed.